Take a road trip to the capital to visit the crown jewel of Abu Dhabi: The Sheikh Zayed mosque. The magnificence and splendour of the temple will amaze you, while the story of its construction will inspire you. As you drive into Abu Dhabi, even from afar you will see the iconic white domes of the mosque shinning under the sunlight. Made out of the finest white marble from Greece and Italy, the structure has 82 domes of different sizes and a thousand columns creating its one-of-a kind silhouette. The mosque is famous for its size and its unmatched beauty; it is the world’s third largest mosque. The interior is full of beautiful pieces like the biggest handwoven Iranian carpet, gleaming chandeliers made of Swarovski crystals, intricate calligraphy, walls painted with verses from the holy Quran and decorated with unique designs…When you step into the white and gold wonder, you will get to experience a special atmosphere of peace, beauty and calm magnificence – an atmosphere like no other. Initially the mosque was commissioned by His Highness Shaikh Zayed bin Sultan al Nahyan, the first president of the UAE. However it was completed only after his death. Built according to his vision it was opened in 2007 to represent the great achievements of His Highness who is laid to rest at the mosque. 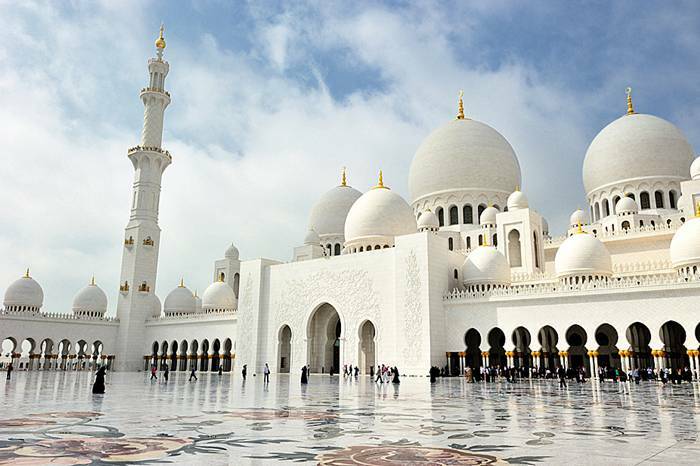 Today the Sheikh Zayed mosque is a symbol of how much a vision of a great leader can achieve. The religious temple and unique artwork is constructed above ground to be seen from any direction. It is Abu Dhabi’s top attraction, one that simply cannot be missed.